The characteristic KyoAni trademarks are there: wonderful lighting, the kind only Makoto Shinkai can top, lots of sakura petals blowing about very fluidly. There’s also the characteristic Key character designs, which focuses on the moe and the standard character types. No surprises here. KyoAni seems increasingly the studio to go to for moe + ravishing TV animation quality. (I’m surprised how much they were able to sneak in some good animation into a show like Lucky Star, whose review, btw, is coming very soon.) The preview doesn’t really give many hints about the story, though, aside from a vague line about “going to the town where my wish was granted,” which could describe, well, almost anything. Especially any Key project, like Kanon. But of course the thing that put Key on the map–making their projects favorites of the likes of Fred Gallagher and a million other anime bloggers–is their ambition. They’ve never been content with simply giving a guy a harem; they usually also want to make you, the player and viewer, cry. I’ve never felt they’ve particularly succeeded. 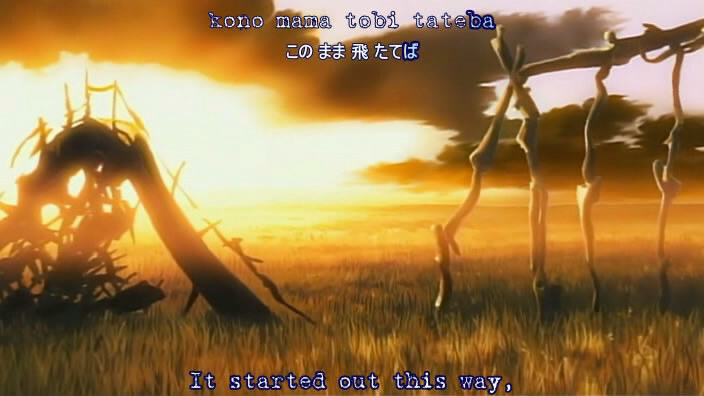 Kanon (the 2002 original; I haven’t seen the remake yet) came closest, though I predicted what would happen and I’ve never been able to take it too seriously ever since I saw it spoofed in Abenobashi. Air was deeply ambitious, and I had high hopes for it. But it ended as an incoherent mess that tried to cross multiple genres, but ended up mastering none of them. I think a big part of the problem is simply the structure of harem shows and games, where you have multiple girls and one guy and the guy’s goal is to please them all in different ways. It’s not conducive usually to the kind of character growth and development that would remain consistent over a single story, unless you are going to take the Higurashi route and tell each possible game ending as a totally separate arc–a strategy which I didn’t think would work but worked very well in that particular case. Though it tends to work better if the “destined girl” is clear from the start–I note that this is what all the harem shows I like (Love Hina, Zero no Tsukaima, etc.) have in common. Maybe it’s because I haven’t seen that many anime that’s good at juggling lots of characters in general, too. But that at least having a clear “winner” in the relationship gives the story a focus and trajectory. 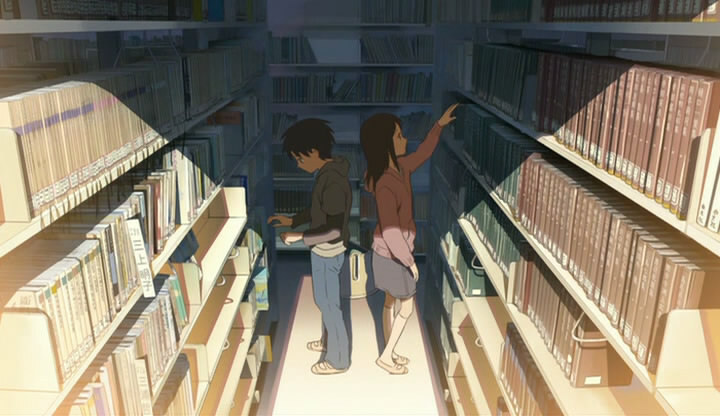 I get the feeling that what Key is really trying to do is, in some ways, what Makoto Shinkai tries to do in his projects. Like with Shinkai, atmosphere, seasons, and landscapes play a big role in Key/KyoAni projects. Childhood promises play a huge role, and a melancholy sense of lost opportunity fuels a lot of the character motivation. Shinkai, though, is a much more nuanced and careful observer of human behavior and speech, which gives his work a feeling of emotional realism even while he idealizes the heck out of his characters and settings. Key seems to want to make more than just wish fulfillment fantasies too, and evoke the same kind of melancholic sympathy which Shinkai does so masterfully. The problem is that so far, none of their stories have been able to achieve the kind of focus and sharp characterization which would be required to reach that goal. Am I being unfair? Is Clannad different, or the 2006 version of Kanon significantly different from the original that I need to give it a new look? 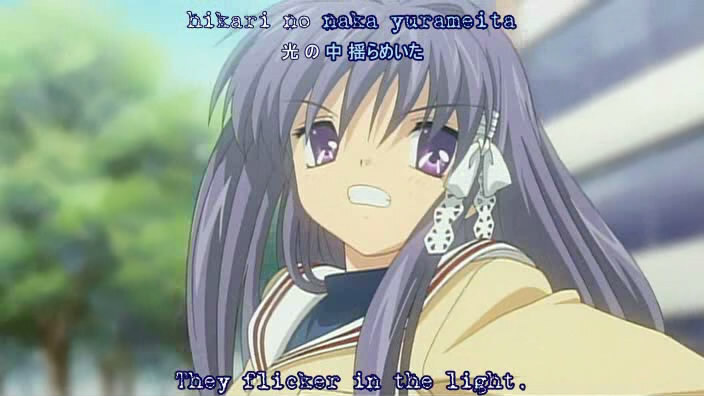 I’d like to know, because I’m thinking of blogging Clannad, but I’m not sure how I want to approach it as a reviewer. Every Key project I’ve seen I’ve really wanted to like, but found lacking in some serious way, and I’m just wondering if there’s something I might be missing. Edit: I just watched the 11 minute promo for the Clannad movie. I realize it’s the film, not the TV show, but if it’s representative of the story in the show too then I’m a lot more optimistic about it than I was just a few moments ago. I found the concept at least captivating and dramatically compelling, much moreso than either Kanon or Air. Previous PostOdex, FUNimation, and Media Factory have requested Section 9 for the crack down…Next PostMy reactions after watching the CM previews for Gundam Balls…I mean 00. 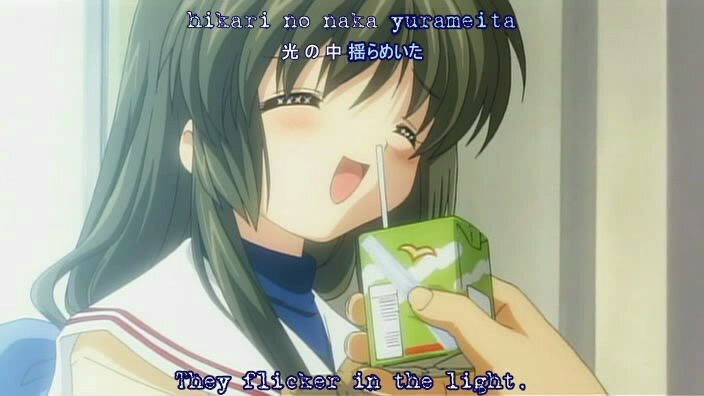 I’m excited about Clannad because of the director behind it. The director is none other then Tatsuya Ishihara director of Haruhi. He was also the director of Air and the recent Kanon remake. Alot of people are not aware of the fact that the director of Haruhi directed Air, the new Kanon, and is directing Clannad. I’m a huge geek and follow the directors of my fav. shows though so yea. I belive the director is what makes the show what it is not the studio. Air was Tatsuya’s directorial debut which is why Air wasn’t as good and everything he is doing now. I really liked Air though but Haruhi and Kanon were way better. If you haven’t seen the new Kanon though it’s really, really good. Although it could have done with out the long story arc of one character which I thought was annoying but it was still good. I have high hopes for Clannad though and with Tatsuya behind it’s going to be great.